Substandard homes and apartments can increase the risk of lead exposure and toxicity, exacerbate respiratory diseases such as asthma resulting from poor indoor air quality, and increase the risk of injuries resulting from unsafe housing conditions. It can also adversely affect the health of other residents living and working in the neighborhood. In particular neighborhoods, crime and economic disinvestment associated with high concentrations of substandard housing and neighborhood blight can negatively impact mental health outcomes, may contribute to chronic stress among residents, and may create significant barriers to adopting healthy lifestyle behaviors such as healthy eating and physical activity. Local government housing code enforcement (HCE) programs are one of the most commonly available interventions that communities use to address substandard housing. HCE involves the inspection, investigation, and enforcement of state and local housing codes. As the first responders to substandard, blighted properties, HCE inspectors can take a range of informal as well as formal legal and administrative actions that encourage property owners -and sometimes tenants- to make repairs, remove mold, clean-up trash, etc. and bring their properties and homes up to code. As Robert Wood Johnson Foundation, Interdisciplinary Research Leaders, Steve Barlow of Neighborhood Preservation, Inc. (NPI), a nonprofit legal and community development organization in Memphis, and a team of senior researchers from the Urban Institute, Christina Stacy and Joe Schilling, undertook a two-year study examining the range of health impacts of housing code enforcement actions on substandard rental housing in Memphis, Tennessee. Memphis ranks high on recent indicators of socio-economic distress, and many Memphis residents live at or below the poverty line. Memphis also has a substantial problem with substandard housing and vacant, blighted properties and is undergoing a major transformation of its housing code enforcement and blight-fighting efforts with the release and endorsement of the nation’s first neighborhood blight elimination charter. Explore the effectiveness of the varying code enforcement strategies on health and safety-related outcomes. 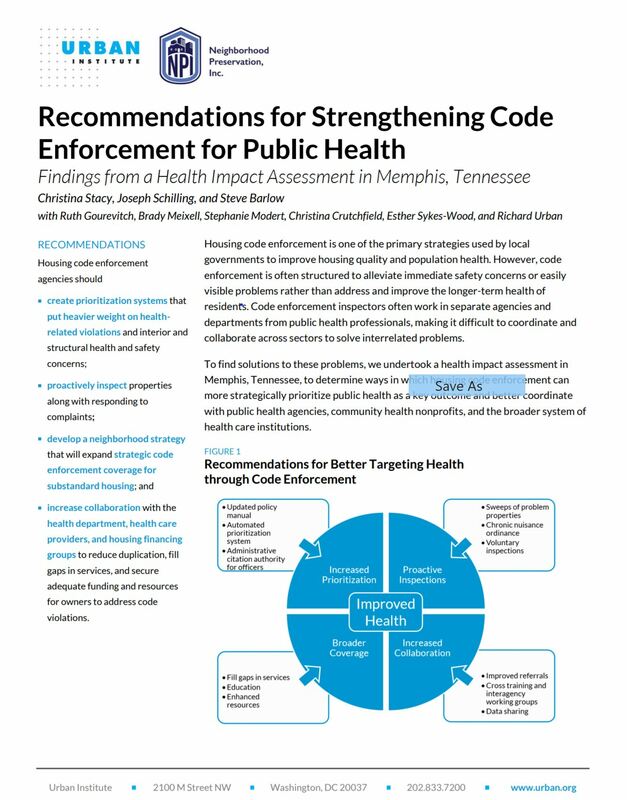 The entire Health Impact Assesment was released in Fall of 2018, it offered program and policy recommendations for how housing code enforcement can help improve health outcomes for residents living in and among vacant properties and substandard rental housing.